Description: Loose Bohemian style rose cut amethyst for replacement in antique jewelry to keep the 'authentic' look or to have set in your made to order antique designed jewelry. 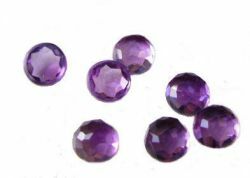 Rose cut amethyst gemstone cabochons have a faceted top and flat back. They are currently only offered in 6.0mm. These are very hard to find, they are hand cut with a polished girdle and have a medium light purple color. They are eye clean with no visible color zoning. Usually jewelers need to scavenge around for junk antique jewelry to pick the antique rose cut gemstones out as the only way to find replacement stones but not anymore. Sold individually.�We can set into one of our settings for a small fee of $15 to $45, depending on the stone size and degree of difficulty to set. These are considered cabochons however and work better in mountings specifically designed for a cabochon. Shipping time: Ships in approx. 3 to 7 days depending on availability.